Tall shrub to small tree, 1.5 to 4 metres tall. Leaves are oval in shape, 3 to 8 cm long, dark green above and lower surface is covered with soft white hairs. 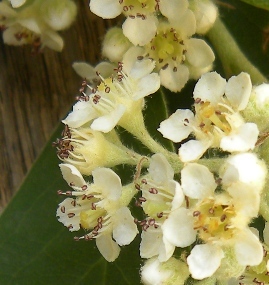 Clusters of tiny white flowers (about 8 mm across and with 5 petals) appear in Spring to Summer on hairy stems. Other species of Cotoneaster all of which have been introduced to Australia.